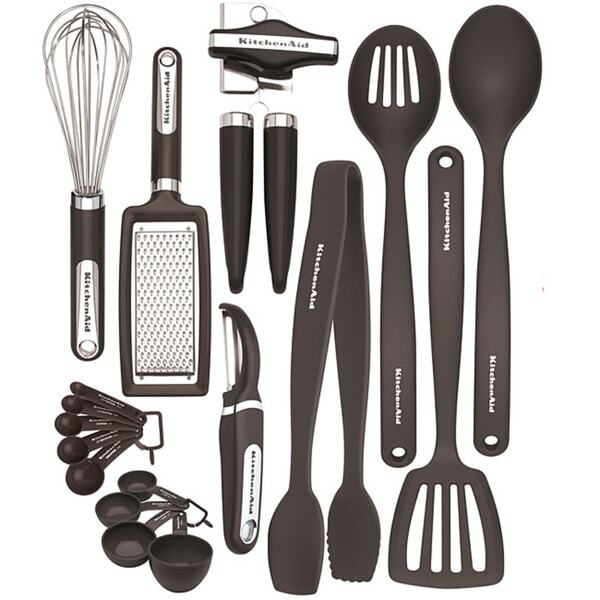 Make easy work of everyday kitchen tasks with the KitchenAid Black 17-piece Kitchen Tool and Gadget Set. This set features a durable nylon construction that ensures years of lasting use. Dishwasher safe and heat resistant up to 450 degrees Fahrenheit, this set is a must-have for your kitchen. I bought the set, and would consider it for myself if I didn't already have another set. Highly recommend the utensil set as well as overstock.com! I was surprised how good each of the items were right out of the box. I was expecting some of the item to be junk, but all of the item are useful. The spoons and spatula are necessary for most non-stick coatings on cookware. The black color is attractive. I recommend this product. This kitchen tool ket set was a great value and included so many of the tools that are necessary for work in the kitchen. I like how they fit together better in my display canister, which is a big deal when you think about how a lot of random tools from various companies and sizes don't fit well when jammed into a container together (what I have been doing for years and what probably most people do). Giving this set as a gift to a young person or newly married couple will be a great gift. I love Kitchen Aid and how their products are always high quality and dependable. I can't think of any negatives with this and the price is great for a complete set like this. I have enjoyed this KitchenAid kitchen tool set! We use these tools everyday, with 5 children, the tool set is put to hard use~Lots of Big meals everyday! I do recommend this KitchenAid Kitchen Tool set! I purchased this for my daughter who is starting her own apartment. This had just about everything she needed, including measuring cups and spoons! Good hard plastic construction. These pieces do not last long. Even with moderate use, they bend with heat and break easily. The can opener, whisk, and measuring spoons were the only useful items. Just buy the pieces that you need. Great for moving to your own place. I use just about every piece of the gadget set except for the tongs. Just give in and buy a proper set of metal tongs. Otherwise, this set is perfect for anyone moving on their own for the first time and do not own any kitchen tools. This kitchen set is of high quality and should last for years. These came very quickly and are very good quality. I knew KitchenAid was a good brand so i chose these for quality and reliability purposes. Definitely will continue to choose KitchenAid products. We bought this for our new home and the kit has everything you could need for a bare kitchen. Highly recommend! It worked great. Good assortment for the price. Not as sturdy as I had hoped for the "KitchenAid" brand but we do use all of the pieces and none have fallen apart! Well worth the money spent. Great quality and we were able to get all of our kitchen utensils to match. Non stick as advertised and would make a great gift for a friend. very disappointed with the material quality. I can fine a pair of this gadget at *** for a cheaper price. Great set - one stop shopping and I love that everything matches. Definitely worth the money. Beware that the can opener doesn’t have a bottle opener embedded in the side of it like I hoped. The order was exactly as described and works well with my kitchen setup. No issues have come up since ordering and i’ll Update the review of this changes. Exactly what I needed and everything has held up well. This is a great kitchen tool set. It is great for newlyweds just starting out. It has everything you need. All of the tools are of good quality. It would cost much more to buy these individual pieces separately. "What color is this set?" It is black. Just like the picture shows. The brand is one I like and the value is great. O.com get's their customers really great bargains.